My first experience of a 3D racing game on the Atari 800XL was with Pole Position. Graphically, it wasn't the most impressive game of it's kind, but the impressive handling of your racing car made the game my favourite 8-bit racer on the Atari 8-bit machines. A couple of years later, English Software released the impressive-looking Elektra Glide which seemed to be receiving rave reviews in some Atari computer magazines. I was a big fan of English Software who released 22 games between 1982 and 1987. 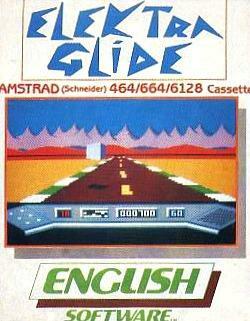 Elektra Glide was the company's 16th release and was also made available for the C64 and Amstrad CPC. Upon loading the game (which took around half an hour using the painfully slow Atari 1010 tape deck) you were presented with a futuristic sound effect and title screen. You could then choose one of three countries to drive in; Great Britain, Australia and the U.S. There was also the option to alter your steering sensitivity. After this, it's straight into the game, and after building speed and coming out of a very dark tunnel, your are presented with a visually stunning, colourful 3D landscape which, at the time, blew me away. What impressed me even more, though, was the speed of the game which forced me back in my chair, whilst at the same time clenching my buttocks tightly so I wasn't left with a brown stain in my pants. I'd never seen anything like this and it took me quite a while to get used to that breathtaking speed. The roadside scenery is lacking, with just the odd tree appearing from time to time, but I would imagine given the limitations of the old 8-bit machines that too much scenery would have slowed down the game considerably. The soundtrack by someone called Yekao is a decent one, although not quite up to any of the legendary Rob Hubbard's efforts. However, after playing the game for a while I became rather disappointed with the lack of depth to the game play. The main objective was to complete the track before the timer on the left-hand side of your console ran out, dodging flying 3D cubes and spheres that hurtle towards you, and blue puddles on the surface of the track. Each time you hit one of these obstructions, your bike (I always presumed it was supposed to be a bike given the title of the game, although there is no reference to this is the original inlay card) you would grind to a halt and would have to build your speed up all over again. A jet would occasionally fly overhead and drop some pillars(?) onto the road just to add to your frustration, for whatever reason! All of this obstacle dodging just became very frustrating and tested your patience to the limit. 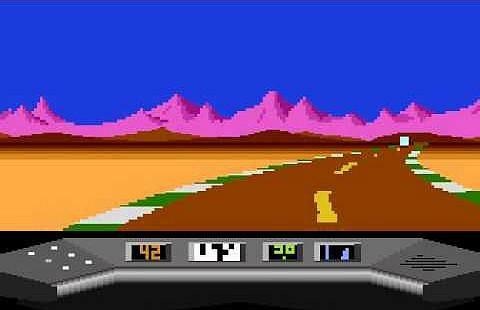 While there's no arguing that the game was very impressive to look at, there were no other vehicles to race against and I was starting to feel rather lonely in this vast, futuristic landscape. Your only opponent was time, and I was soon yearning to play Pole Position again, despite it's slower gameplay. Oh, English Software! If only you had created a proper racing game then this would probably have gone down as the best 3D racer ever to be released on an 8-bit machine - the old cliche "style over substance" rears its ugly head again. By the way, do watch the video review as the commentary is by Steve Benway (his video reviews also feature on other pages of this site) who is playing the game for the first time with amusing results. Unfortunately, there are no videos available representing the C64 or Amstrad CPC versions of the game, but should any become available then I will, most definitely, add them to this page.